Fabulous and Brunette: Across Two Novembers: A Year in the Life of a Blind Bibliophile by David L. Faucheux - Book Tour - Guest Post - Giveaway - Enter Daily! Across Two Novembers: A Year in the Life of a Blind Bibliophile by David L. Faucheux - Book Tour - Guest Post - Giveaway - Enter Daily! Hi lovelies! It gives me great pleasure today to host David L. Faucheux and his new book, “Across Two Novembers: A Year in the Life of a Blind Bibliophile”! For other stops on his Goddess Fish Promotions Book Tour, please click on the banner above or any of the images in this post. Be sure to make it to the end of this post to enter to win a library edition audio book (US only) or if an international winner, a $15 Amazon or Barnes and Noble Gift Card!! Also, come back daily to interact with David and to increase your chances of winning! While in the waiting area at physical therapy prior to this morning’s session, I met a former coworker of mine on her way out. Just as I did, Quintina taught in the early 1990s at the Deaf Action Center (DAC). I liked working there, but it was very part–time, and I pursued other employment. The director of DAC was a great supervisor, and I wish I could have taken her with me to other employment situations. She had a genuine appreciation of her employees and was always professional and pleasant, even kind. I have continued reading Madame Picasso. I’m researching Louisiana’s early history. It wasn’t so great in the 18th century—no elegant riverboats and mansions, rather frontier–like. Tonight I attended Novel Ideas on accessibleworld.org; we discussed Christina Baker Kline’s novel Orphan Train. I enjoyed the book, which dealt with the relationship between foster teen Molly and orphan train survivor Vivian Daly. Daly tells Molly of immigrating to America from Ireland in the early 1900s and being sent to Minnesota on an orphan train after her family dies in a New York City tenement fire. The novel is rather dark, as Vivian is exploited as cheap labor by several families. Speaking of reading books about Picasso and the art world, I learned while reading Color: Travels Through the Paintbox and doing research on Wikipedia that ultramarine refers to a pigment which was originally made by grinding lapis lazuli into a powder. Ultramarine was the finest and most expensive blue used by Renaissance painters. It was used for the robes of the Virgin Mary, and it symbolized holiness and humility. It remained an extremely expensive pigment until a synthetic ultramarine was invented in 1826. The best lapis lazuli is said to come from the Sar–e Sang (or Sar–i sang) mines, in the Badakhshan region of Afghanistan. The turban of the Girl with a Pearl Earring, by Vermeer, is painted with a mixture of ultramarine and lead white, with a thin glaze of pure ultramarine over it. 1. 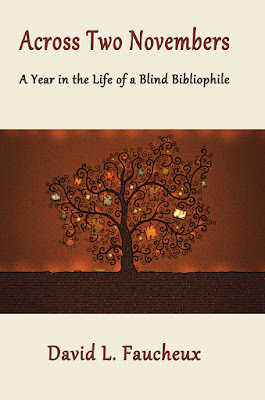 Journal/Memoir: My recently publish book, Across Two Novembers: A Year in the Life of a Blind Bibliophile, is a journal. By that I mean that it covers a year in my life with daily entries. I try to take you into my world and show you how I occupy it. But it’s more than that. There are elements of memoir in this journal, because folded into the text like sugar into beaten egg whites are memories triggered by books and other events. If this book were strictly a journal/memoir, you’d be getting a great deal, but wait there’s more! (Don’t I sound like an infomercial here <G>? 2. Trivia: I include Did-You-Know bits sprinkled throughout the chapters. Think of them as the toasted pecans of the book. I mention the color red, the origins of vanilla, decimalized time, the anatomy of the giraffe, metric prefixes, and more. 3. Food: And there are restaurant reviews, food mentions, and food bits. Our local food scene is considered very happening now. I wanted you to have a taste. Think of the journal as if it were a box of assorted chocolates or an appetizer plate. Dive in anywhere. Read the epilog, introduction, and any chapter or daily entry. Read your birthday entry. Just dive in anywhere. This type of nonfiction accompanies other books beautifully. You can take a break from that suspenseful read that is keeping you up all night or that crazy mystery and slow down a bit. 4. Book Reviews: As this is an account of a bibliophilic year, we must serve up a triple helping of book reviews which I do. I received permission from Library Journal to include the book reviews I did during the time covered in my journal. I hope one or several of them catch your attention. 5. Lagniappe: In Louisiana we have this custom of lagniappe, a bit extra. Shop keepers would include a bit of extra when you purchased from them as a way of thanking you for your patronage. Perhaps, they’d include a handful of candy for the children. I’m honoring this custom in my book. The lagniappe you get with my book is a book-related quote with every chapter, a monthly book bag section where I mention books I particularly enjoyed that month, and even extracts from a book blog I kept in the past. An extensive bibliography and webliography and author’s notes – that my editor and I worked on extensively -- add richness. David will be awarding a library edition audio book (US only) or if an international winner, a $15 Amazon/BN GC, to a randomly drawn winner via Rafflecopter during the tour. Greetings Visitors of Fabulous and Brunette! I'd like to thank our host for this opportunity. I have been enjoying my book blog tour. Go Goddess Fish! Today, I'd like to ask the question: What narrative style do you prefer in your fiction? Personally, I enjoy the traditional first-person, past tense. I also enjoy third person, past tense. I have noticed an increase in first-person, present tense. I'm thinking of the novella Gwendy's Button Box by Stephen King, which I read yesterday. Oh, to write like that and have that imagination!!! (Even just 10"%) Somehow it works. It can with lots of action and dialog. Congrats on your book release and thank you for sharing an excerpt with us. The five reasons why was really insightful as well! Congrats on your tour! Great excerpt!